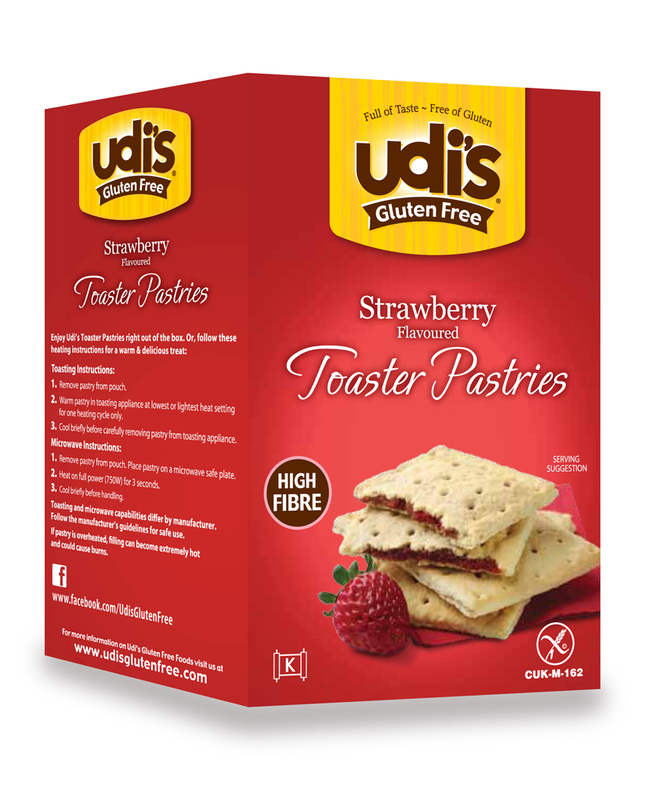 Udi’s have recently crossed the pond and brought a range of gluten free products to the UK market. Udi’s are a big player in the States and some of their products are even available to buy at Baseball stadiums. As a football fan I can only dream of seeing gluten free options within stadiums at the moment. So what can Udi’s bring to the table in the UK? Well there are certainly some products that have not been previously seen in gluten free form in the UK before, or at least not readily available. These products include bagels and a version of pop tarts which seem to be proving popular with the gluten free community. I was lucky enough to receive a sample pack for review which included cinnamon and raison bagels, mince pies, muffins, toaster pastries and ancient grain jalapeño cheddar crisps. 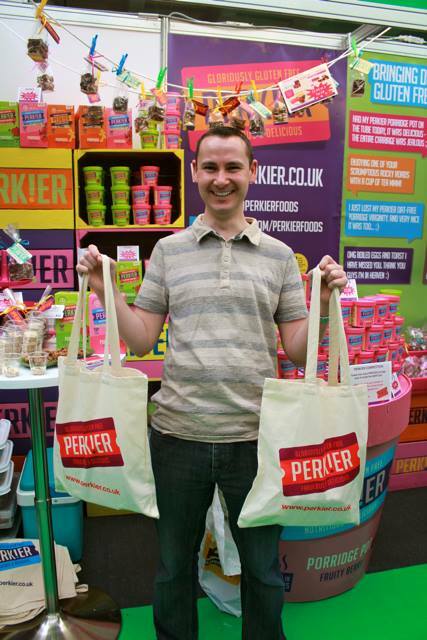 I had also bought some products myself, when they became available to buy nationally in Tesco. Below I have a look at the products and what I thought of them. Toaster pastries: Otherwise known as pop tarts, these were something definitely missing from the UK market. These are available in two flavours; strawberry and apple cinnamon. These items have proved very popular amongst coeliacs and the gluten free community, with many people delighted to be able to have a “pop tart” again after so many years. I thought they were pretty good, the filling tasty but for me there was a bit too much pastry for the filling. It’s worth saying I wasn’t a pop tart fan in my pre-coeliac days. Bagels: Another American favourite which has been missing from the breakfast tables of UK gluten free folk. As I don’t like raisins I passed the cinnamon and raison bagels to a gluten eating friend who gave them the thumbs up. I have however tried the plain variety. Firstly I tried them toasted and simply buttered, which I liked far more than I expected. I’d never had a regular bagel before my coeliac diagnosis so wasn’t that bothered by them. 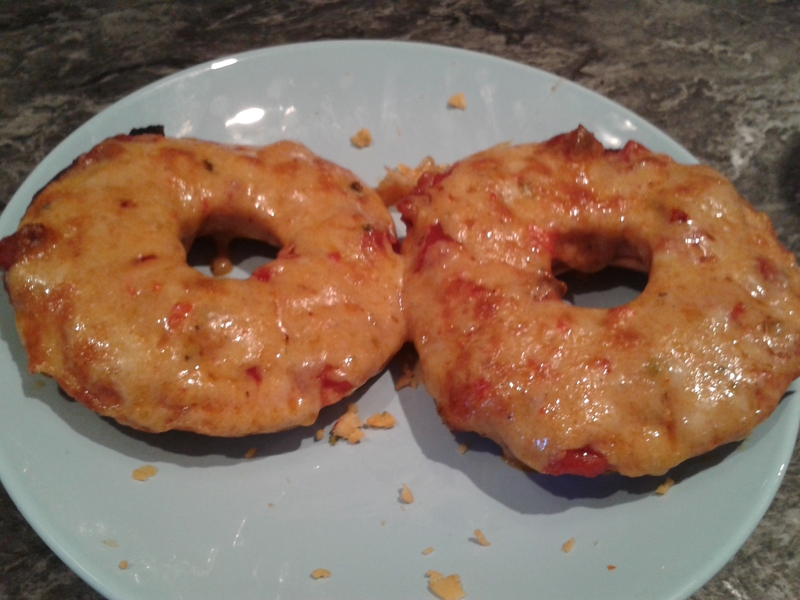 I also had them toasted and covered in salsa and Mexicana Cheese, after a suggestion from Kim of Coeliac.me.uk. This proved to be a fabulous combo which I’d definitely have again. The bagels are also available in a savoury flavour. Muffins: The muffins come in a pack of two, one chocolate chip and one toffee. I love muffins and these had both great texture and good flavour. I also quite like the idea of getting two varieties in one pack. They do contain a lot of ingredients and I’d probably be inclined to buy something locally produced if available. Having said that I’d happily eat them again. 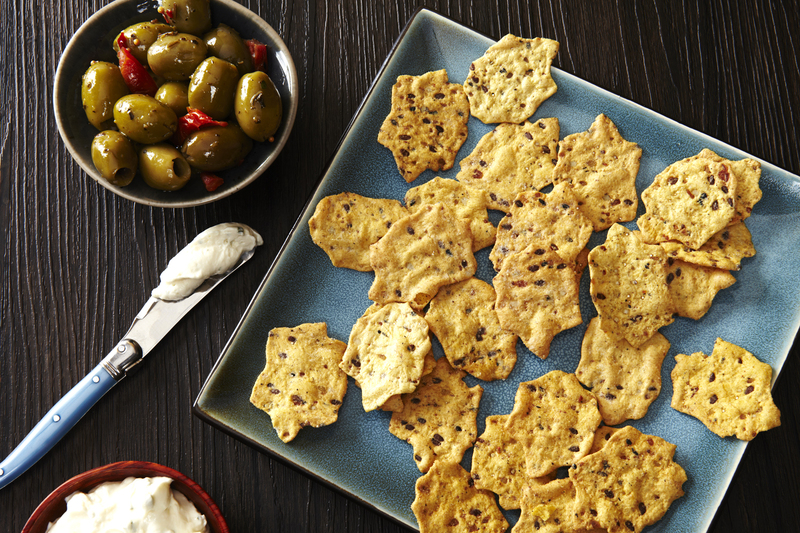 Ancient grain crisps: I am a total crisp fiend and the jalapeño cheddar snacks definitely get a big thumbs up from me, and some gluten eaters I shared them with. I love anything spicy ans these certainly had a bit of a kick. Texturally these were really unusual. My best description would be a multi seeded tortilla chip, and I thought it worked really well. I ate them as they were, but they’d also work well with a salsa or sour cream dip. They are available in cheddar flavour if spicy isn’t your thing. Breakfast bars: These bars come in both strawberry and blueberry flavour and make a perfect on the go breakfast. They are very much like the Nutri Grain bars I used to enjoy as a gluten eater. They are soft and chewy and have a tasty filling. I recently took a box away with me whilst I was working away in Cambridge, and these really helped me through some tricky breakfast situations. 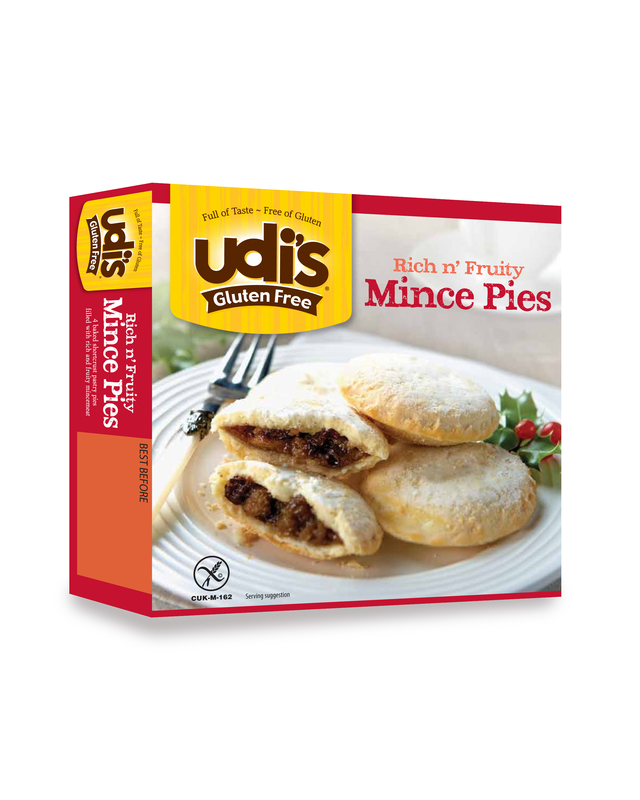 Mince pies: Unfortunately I am not a mince pie fan at all, so these also went to my gluten eating friend Adam, who said they were really good. For another viewpoint see this positive review on the glutenfreeb website. Other products which I’ve yet to try include bread and rolls. I’m happy to see they have a gluten free finger roll which is something I always cry out for come BBQ season! The final products amongst the UK portfolio are bagel chips and granola. I always prefer to buy local if it all possible, but I think Udi’s have definitely brought something different to the UK and will have given the likes of Genius and Newburn Bakehouse something to ponder. Like most gluten free products they are not the cheapest, but there are a few things here that I will likely buy again if I find myself in Tesco. So what have you made of these new products? Well first of all, let my apologise for the recent blog silence. I have just had one of those periods when everything has gone wrong, one after another and unfortunately life has had to take over for a while. Major works at both our house and our rental property, sick cats and working away have featured heavily and it’s been all go. I’ve not had the time (or the money!) to focus on blogging. Thankfully there is light at the end of the tunnel, so I’m hoping normal service will be resumed soon! During this period of silence, the second anniversary of my endoscopy, and hence eating gluten free, quietly slipped by. Some of you may remember my blog post accounting my diagnosis and the experience of my first year living gluten free. Year two has been much less dramatic and really quite mundane in comparison, and to be honest I thought what’s the point in writing about year two if there’s not much to say? Then I thought to myself you know what, how much would I have given to have considered coeliac a bit mundane two years ago? So here are some of my thoughts on year two, if only to show the newbies that it does get better. Firstly, the year has passed without a major glutening. I really regard this as a major achievement to go a whole year with no slip-ups. The only problem I can remember having, is some minor symptoms which I put down to some contaminated draft cider whilst out. This has obviously made a huge difference to both my physical and mental state. It’s worth saying that I haven’t led a sheltered life to achieve this. I’ve eaten out regularly and tried lots of great new foods. I tend to stick to quite a small pool of restaurants when eating out though to be honest. I’ve got my favourites in both Plymouth and London and I know I can eat at these places with confidence. I think I’ve learned to handle the awkward questions better when I eat somewhere new though, and have some places on the list to try in Plymouth that I hope to be bringing reviews of in the next few months. So overall it’s been a year of feeling pretty healthy. No brain fog, no joint pain and I feel I’m getting close to where I should be. I know others struggle so don’t want this to come across as smug, but I hope those struggling can take comfort from the fact that if you work hard and are determined at living strictly gluten free, then living with coeliac disease doesn’t have to be a constant nightmare. I think that this year I’ve lost that feeling of being a freak. I have immersed myself deeply into the coeliac and gluten free community via social media, and you guys really are like my extended family. It is such a comforting feeling to know that you’re not alone, and actually there are loads of us in the same boat. I thank each and every one of you for helping me feel this way. Gluten free has of course gone more mainstream in the past year and this has undoubtedly helped too. I may well have banged on a bit about gluten free pizza on this blog, but the fact that chains like Domino’s and Pizza Hut have come on board really has helped to give a feeling of normality. Being able to join in on the work pizza runs for example, it’s great to feel included instead of having to sulk in the corner with your packed lunch. One thing I have done this year is learn to say “no thank you”. I no longer feel the need to constantly explain myself, or the urge to tell someone being nice and offering you a piece of cake to $%@# off! I am now able to just smile and say no thanks without feeling the need to give the person offering a ten minute lecture in coeliac disease. Of course there is still the odd occasion when this is necessary! Through running Gluten Free by the Sea and being part of the gluten free community on Facebook and Twitter, I have managed to find so much (largely locally produced) gluten free food that I no longer feel like I’m missing out. Maybe I’ve just forgotten what wheat filled nasties taste like, but I’ve lost that constant hankering for a sticky bun or similar. There’s great gluten free food out there, and I feel so much better so why worry about it. Gluten Free by the Sea has grown over the year, and this has also led to me being invited to join the committee of the Coeliac UK Plymouth Voluntary Support Group. It has been highly rewarding being able to help people through these mediums and it is not lost on me that I would never have done anything like that pre-coeliac. 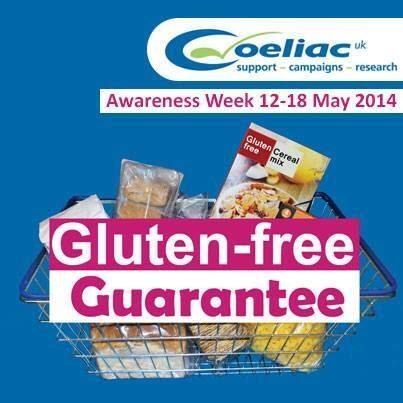 I firmly believe getting diagnosed with coeliac disease has helped me come out of my shell and grow as a person. Two failings of the year following my one year post though are my failure to make that first trip abroad, and I haven’t really pushed myself enough in developing my cooking skills. These will have to stay on the list of goals for year three. I realise, and am very grateful for, the fact that I only need to avoid gluten. My thoughts are always with those who have to battle multiple allergies and intolerance, and I hope during year three things will get better for all of us. For those who are newbies or simply still struggling I hope you can find your “normal”, your “mundane” soon. Finally I just wanted to say a big thank-you to my wife, Abby, my family and my friends. You’ve all worked so hard to understand and be accommodating and it is appreciated. Others are not so fortunate.